In the middle of the 19th century, when the traditional value of Eastern Asia was completely destroyed by the World Imperialists, the Eastern Learning (Donghak) was at the heart of East Asian history and culture. In April 5th, 1860 by the lunar calendar, Sacred Venerable Choi Su-un received a heavenly mandate from Sangjenim in Gyeongju. Gyeongju was the capital city of Shilla dynasty which had lasted for a thousand year. It was a defining moment, when Su-un received the heavenly mandate from the Sangjenim, the Ruling God of the universe, that the new culture of spirituality opened its way in the history of human civilization for the first time. 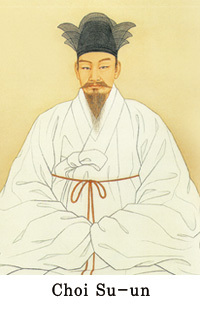 Su-un’s enlightenment was the genesis of opening the new era and it was the true starting point of the modern history. In upholding His heavenly mandate and spirit teachings, Su-un founded and proclaimed Donghak, the Eastern Learning; in a short time, it spread across the land of Joseon. The news of Sangjenim’s advent in the Eastern land, Korea and the coming new era of the “Supreme Dao of Mugeuk” by Donghak became the very momentum that the actual modern history began in the Korean peninsula.